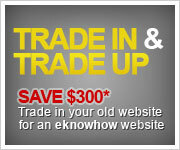 Experience a no-obligation demonstration and find out how eknowhow can benefit your business. eknowhow's expertise and comprehensive website functionality means that there is no faster, easier or cheaper way to maximise your online success. Please complete the form below and we will contact you within 1 business day to arrange a no-obligation demonstration, or telephone 03 9510 9300.